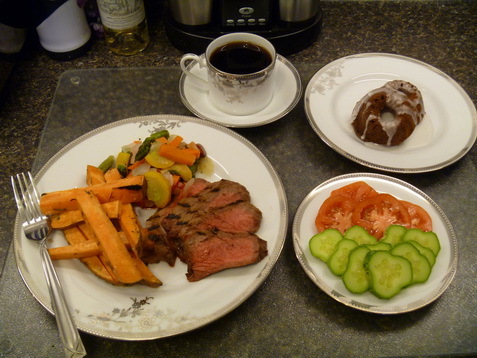 Swap out your “French Fries” for oven roasted sweet potatoes, steam up some carrots, asparagus, zucchini and squash, grill a London Broil to perfect pinky medium rare, slice fresh tomatoes and cucumbers for a refreshingly crisp and flavourful side dish, and make homemade mini-bundt cakelettes with a powdered sugar glaze. Simple, quick (from start to finish, less than 45 minutes, and most of that is baking the cakelettes), and the food stretches amazingly. 3 large sweet potatoes serve 4 people, as does a nice 1.5 lb London Broil. A homemade recipe for chocolate cake (used in the mini bundt pan) makes 24 cakelettes, which serves 12. Prepare your mini bundt pans by spraying with a non-stick spray that includes flour (alternatively, butter and dust with flour). Set aside. Preheat oven to 350 F.
In a large bowl, stir together your dry ingredients (the sugar, flour, cocoa, baking powder, baking soda and salt. Contrary to other recipes, the sugar IS a dry ingredient in this recipe.) Add the wet: eggs, milk, oil and vanilla, and mix for 2 minutes on medium speed of mixer. Using a rubber spatula, stir in the boiling water. Don’t worry, this batter will be thin, but that’s okay. Fill the mini bundt wells about 3/4 full of the mixture. You should have just enough batter to fill all 24 wells, if you scrape down the bowl. Bake 30 to 35 minutes, until the cake tests done with a toothpick. Cool in the pans for 10 minutes, then remove from pans and place on a wire rack to cool completely.